So a new year has started and plenty of people make New Year’s Resolutions to do this and that, but I started my year off with a bang~a huge piece of cake. I am sure that most people are sitting around thinking about how they are going to start working out in the new year (I promise that I’ll hit the gym next week), we decided to make our yearly trip to the City Cafe Diner. Their portions are huge and you get so much food that we can only go there once a year. They also have the most fantastic deserts. 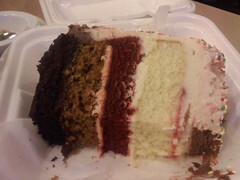 I always get a piece of the Sampler Cake: chocolate cake with chocolate frosting, carrot cake with cream cheese frosting, red velvet cake with cream cheese frosting, vanilla frosting with a strawberry frosting, and then topped with a layer of cheese cake and more frosting. It usually takes me a couple of days to eat this and I can’t imagine how many calories, but it’s all worth it.